No, I didn’t forget the c’s in the title to today’s post…..this one is all about two secret weapons I always take with me on certain rides. Yep, I’m talking Clif Bar Shot Roks and Shot Bloks today…..plus we have a nice little giveaway for you as well (see bottom of post for details). Long before I “got involved” with the great people from Clif Bar, I’ve really liked their products and how they’ve helped with my performance on the bike. I first wrote about Clif Bar and Shot Roks back when I used to live in Canada and I cried out for help because that product wasn’t available there, and I wanted to get my hands on some. You can check out my love for Shot Roks and the review right here. It was actually that post that led to the relationship Loving the Bike now has with Clif Bar, and we’re very happy it all worked out this way. But just so you know, I was loving these products long before becoming an ambassador for the company. Okay, so Clif Bar makes a lot of great products but I wanted to mention two of them that are always with me on ride of around 50 miles or more. I consider them my secret weapons and the combo has yet to let me down. With all the choices and products out there, how come these are the two that grabbed my attention? I’d say it’s a combination of convenience, taste, performance, and superstition. The Roks are fantastic because prior to riding I can take them out of the package and just pop one in my mouth whenever I need it. I don’t have to worry about opening packages, melting, or holding onto a bar while riding. Total convenience, great taste, and as I talk about in this review….performance. 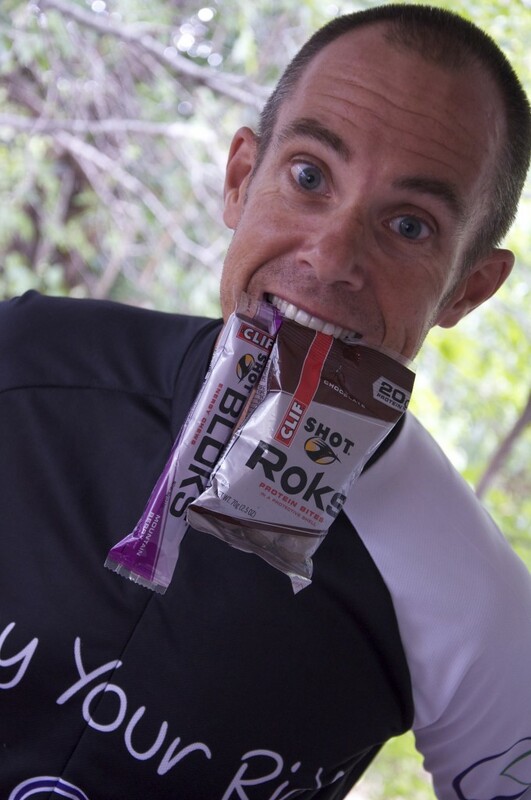 Basically, Shot Roks are protein bits which are a very important part of proper nutrition while riding. The Bloks are the perfect accompaniment by providing carbohydrates to my working muscles. But just like the Roks, I can easily pop them in my mouth when needed and to me it’s so much simpler (and less messy) than dealing with gels. Basically, Bloks and Gels are the same thing….but I like the bloks because they taste great, are easy to ingest while on the bike, and are customizable (you can take as many of them as you feel you need at the time). I’ll pop anywhere from 1 to 3 of the Bloks at a time (Clif Bar recommends taking 3 to 6 per hour during exercise along with water). Oh, and I crack the packaging open prior to the ride so I don’t have to mess with that while out on the road. Yeah, I’m all about ergonomics. So what about taking my secret weapon combo on all rides? Well, I like to suggest to people that sports supplements should only be taken when absolutely necessary. In my opinion, rides of one hour or less don’t require anything other than water. Rides between one and two or three hours can definitely be done just with water, but things like hydration tabs and Energy gels or chews might be a good idea as well. If your ride is taking place at a time where it’s been at least a few hours since your last meal, taking along some sort of protein is a good idea as well. For rides of over four hours, I recommend taking along all three types of nutrition. If you have more questions on this, feel free to contact me (and our Nutritionist, Kelli) so that we can ensure you’re taking the right nutrition with you on your rides. Good Cycling starts with Good Nutrition. For more specific information and details on Roks and Bloks, check out these FAQ’s: Clif Bar Shot Roks and Clif Bar Shot Bloks. This is sort of a backwards contest because to enter, we want you to tell us about Clif Bar products that you have never tried. Yeah, we’ll customize your prize pack so that you’re able to try out some new Clif Bar Goodness. Below is a list of the products we’ve got available to you (click on them for more information)….tell us which ones you’ve always wanted to try out by leaving a comment for us below, and you’re in to WIN. Contest closes on Friday, November 4th at Noon EST. The Contest is now closed. Thanks to everyone who entered and we’re pleased to announce that Pamela is the winner of our Customized Clif Bar Prize Pack. Keep a look out for more Clif Bar contests and giveaways over here at Loving the Bike. Leave it to a mom to make this comment. What pretty straight teeth you have. Now, on to the contest, I have never tried he Trail mix bar but am going to go search it out right now. I didn’t even know they made a crunch bar and what in the world is a Clif builder. My husband swears by tthe bloks and gels and I love the macadamia nut bar so I am surprised we didn’t kow about these others. I need to get in on this contest. So far I have never tried the Mojo bar, Bloks, and Roks. Please pick me so I can try these out. Glad you got in on this. We’ll be picking a winner in just a couple hours…..good luck. I am curious about both the roks and the blocks. My absolute favorite are the peanut butter pretzel mojo bars! They are just the right amount if sweet and salty without being cloying! I totally agree with your comments on the Mojo’s. I didn’t think I was going to like them, but now that I’ve had the chance to try them out….I really like the taste. You’ve definitely got to try out the Roks and Bloks…..the best two products made by Clif Bar in my opinion. Good luck in the contest. You’re spot on Darryl. Clif makes great products. The only products I haven’t tried ate the Builders and Granola Bars. Another good thing about Clif products is that they’re available at Target department stores. That’s handy when I’m in a town without a bike shop or running store that’s open. Great point, Dave. I also like that Clif Bar is found in so many places. I’m sure for someone who travels as much as you do, it’s very appreciated. I’ve not tried the Builder’s bar, Gel, Roks or Mojo. I’m most interested in the Roks. I’ve seen another review and wanted to try them before, but can’t find them locally. I do like the Bloks, Bars and Granola Bars though. Bloks and similar products are my fave on the bike. As you saw in the post, I’m a mega fan of the Roks. A must for my longer rides. Good luck in the contest and either way, I hope you get to try these products out. Definitely the Roks. I’ve only tried Clif Builders and Clif Bars, they’re the only ones available where I live. I would love to try the Shot Bloks. Great to have you entered, Jessy. I’m sure more Clif products will make their way to where you live. Good luck for the giveaway. I’ve been a fan of Cliff Bars for years (a competitor’s Bar was frozen solid as ice on a winter climbing trip years ago). I’ve used the Shot Bloks for years and have to agree with you on the convenience (none of the sticky hands syndrome). Based on your comments I’m definately going to have to give the Roks a try. Thanks for reading the post and I’m glad my recommendations got you interested. I speak from the heart and would never promote a product I don’t totally believe in. Let me know what you think of the Roks when you try them. I haven’t tried the bloks or the trail mix bar. Sound good tho! Thanks for entering the contest, should you win….we’ll fill you up with Bloks and Mojo’s. Yeah, the granola bars are really good. I don’t generally eat granola bars, but I’ve found myself munching on these. Good luck in the contest. I’ve love Clif products, but have tried only the bars and granola bars. I’ve always wanted to try gels and I’m curious about bloks after your post. So those are the two I’d like to try. Hi Dan, thanks for leaving your comments. Yes, I think you’d like the bloks and we’ll definitely include them and a whole bunch of gels should you be the lucky winner. We’ll announce the winner on Friday. This is a great contest, Darryl! Congrats again on becoming an ambassador for Clif. I love the Shot Bloks and enjoy Clif Bars. I haven’t tried the other products (Builders, Crunchy Granola Bars, Shot Gels, or Mojo Bars). Thanks for your warm comments, Bob. Good luck in the contest and thanks for being a strong supporter of Loving the Bike. The only product on the list I have never tried is the Builder bars. However after reading your post I would love to try the Roks, but alas they are not on the list. Hi Bob, thanks for entering. I don’t have any of the Rok Shot samples, but how about this? If you win, I’ll be sure to pick some up and add them to your prize pack. You really need to try them out. The Clif Mojo Trail Mix Bar looks to be a tasty treat. I wasn’t aware of all the other products Clif offers. I like the bars, oatmeal/raisin is my favorite, and haven’t looked beyond them. By far, adjusting my diet has been my biggest challenge. I eat a whole lot better than I did at this time last year, but there is room for improvement. Clif Bar is one of the good habits. They are relatively low-glycemic and that is very important to me, as my biggest strides have come from making the adjustment in my diet to include more low-glycemic foods. You’re welcome, Joel and as always I appreciate what you have to say. Keep on moving forward with positive choices for your nutrition. I religiously carry the Shot Bloks with me for longer rides. They’re fantastic! I love the flavors (especially the margarita ones) and love even more that they aren’t a mess to eat. I’ve tried about everything Clif Bar makes, but haven’t yet tried the Roks or Clif Builders, and would be interested in trying them out for sure! I’m a big believer in fueling up before, during, and after a hard day on the bike and think these products would be awesome to try out on my next ride. Thanks for the post Darryl! You’re going to love the Roks, Krissy. I feel they are a must for rides over about 3 1/2 hours. Good luck in the contest. Love the gels. Would like to try granola bars and mojos. Just noticed Clif Builders on the shelf this week…how long have they been available? Looking forward to trying them. Would love to have an easily accessible protein punch after a killer workout but not if it tastes like I’m chewing on my cycling shoe! Protein bars tend to have that killer aftertaste that makes you think your brother was messing with your snacks and did a little meal replacement when you weren’t looking! I’m not sure when they first came on the market, but they’ve been around for quite a long time. I liked your comments and can tell you that there isn’t any aftertaste with these bars….at least I don’t feel there is. They taste fantastic. Good luck. I have never tried the Builders bar, Granola bar, or Mojo before. I’ve like any other Clif Bar producst I have tried before so I’d like to sample these as well. Thanks for providing the opportunity. Good luck, and thank for entering Pamela. Hi Pamela, you are our lucky winner. Please send your mailing address to darryl@lovingthebike.com and we’ll get you out a huge package full of Clif Builders Bars, Granola Bars, and Mojo’s. Congratulations. I just saw this and am so excited. I can’t believe I won something. I can’t wait to try out these products. I am going to send you an e-mail right now. Thank you so much for selecting me as the winner. I haven’t tried the Bloks or Roks yet, or the Builders Bar. I love the regular Clif Bars most of the time, both on bike and as a snack. Would love to try the Bloks. I get extra protein from hemp protein smoothies so not sure if I need to try the builders bar, but options are always good. Ahhhh, another hemp lover. Great to see it. We need to get ClifBar to start making hemp bars, right? Have you tried these hemp seeds from Nutiva? Here’s the link: http://store.nutiva.com/aff/184A7AD18B76220132F4BCC204051600/index.html. I haven’t tried that, yet. Will have to. I’ve been using the Trader Joe Hemp Protein Powder. I imagine it’s the same stuff as the Nutiva with Trader Joe label. I totally agree that Clif should make some products with hemp in it. I think it would fit in well with their products. I’m going to have to e-mail you about this. Organic Shelled Hemp Seeds will be so much better for you than the powder. I don’t think Nutiva makes the powder, only the real deal. Be sure to check it out and let me know if you have any more questions. I’ve been a Honey Stinger man myself, but I’d like to give the Clif Shot Gel and the Roks a go to see if they can fuel my mad pace on the mountain bike trails! Thanks for entering, Sonny. Keep on ripping up the trails and good luck in the contest. Would you believe that I’ve never tried any of the Clif products before? I have tried several other companies and would like the opportunity to try some of these. The shot bloks look like a good idea for sure. Yeah, Eric there are a lot of companies making things these days. Good luck in the contest and I hope you get the chance to try them out one way or the other. I haven’t tried the Bloks or Roks…or the builders. I am a huge Cliff bar/Mojo fan though! I like citrus flavors…and chocolate/peanut butter flavors. Great contest thank you! Thanks for entering and leaving your comments. I hadn’t tried the Mojo until just recently, and I think they are good as well. We’ve got your list of what you haven’t tried together and should you be the lucky winner, we’ll get these in your prize pack. On a side note….if you like chocolate and peanut butter together, do you dig that combination in ice cream? Yeah, totally random….but man they taste so good in ice cream. Thanks for entering, Marty. My Son and I really like the Granola Bars as well….and I, of course, love many of their other products. Good Luck. I have never had one of the builder bars or the Roks. Ive had almost all of their other products and I really like their products. The blueberry bar is my favorite product so far, but I also love the bloks. I dont know if they still make Cola flavored but if they do Id love to try those. You definitely need to try the Roks….definitely a must on a long ride. I have not yet tried the Clif Shot Bloks and I’m thinking I’d really like to. I’ve a steady stream of Clif Bars, really like the Mojo bars, and use the Clif Shot Gels (especially that elusive flavor of Chocolate Mint that I found a few years ago and haven’t seen since. I’d grab one of those for dessert at any time just to show how much I liked it). So you might be able to detect that I already like Clif products. As a budding middle-aged cyclocross racer I’m racing two races. A Clif Shot before race one is good. Between races a second really helps me recover BUT my hands are still a bit shaky from race one. Then I end up getting my Clif Shot on me, my bibs, my legs, my gloves… and I think the Clif Shot Block would be a much better solution in this situation! Thanks for your comments and for entering the contest. Yes, I prefer the Bloks….especially when out on a ride. Good luck in the contest.